In-demand Hibernian striker Jason Cummings scored twice against Falkirk to get Neil Lennon's domestic tenure as head coach off to a winning start. 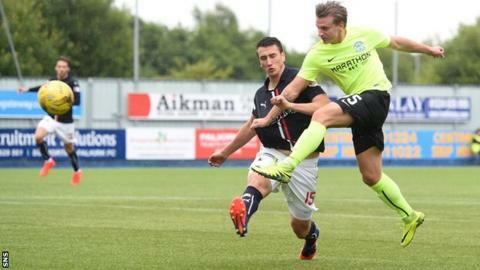 Fresh from being subject to a declined £1.2m bid from Peterborough United, Cummings pounced in the six-yard box to give Hibs an early lead. That was quickly cancelled out by Craig Sibbald's tremendous 25-yard strike. But Cummings thrashed the ball high into the net straight after half-time to ensure Hibs took all three points. That clinical brace may add a few more pounds to the price tag of 21-year-old Cummings, especially when it came against a team many fancy to be one of Hibs' main challengers for the Championship title this season. Lennon joked before the game that if Cummings did not play well against Falkirk, he would drive him all the way to Peterborough. On this performance, there will be no need for the new Hibs boss to fetch his car keys just yet. Cummings started and finished the opening goal; first playing through James Keatings and having the desire to be in the right place at the right time when Falkirk goalkeeper Danny Rogers parried Keatings' low drive. The away support were boisterous and large in number, though silenced somewhat when a left-foot pearler by Sibbald scorched past Ross Laidlaw and into the top right corner to mark the midfielder's 200th appearance for the Bairns. Apart from Bob McHugh going close for the hosts, scrappiness was king in the rest of the opening half but Cummings once again lit up proceedings soon after the break. Lennon likes the quality and experience of new signing Grant Holt - formerly of Norwich and Wigan - and it was the Englishman who lofted the assist on this occasion. Cummings controlled and held off the attentions of David McCracken before lashing what turned out to be the winner into the top near corner. McHugh perhaps had the Bairns' best chances of another leveller; one of his efforts cleared off the line by Hibs captain David Gray and another shot from the right side of the box flashing narrowly over Laidlaw's crossbar. Match ends, Falkirk 1, Hibernian 2. Second Half ends, Falkirk 1, Hibernian 2. Corner, Hibernian. Conceded by John Rankin. Substitution, Hibernian. Jordan Forster replaces Darren McGregor. Lee Miller (Falkirk) wins a free kick on the left wing. Corner, Falkirk. Conceded by David Gray. Substitution, Hibernian. Martin Boyle replaces James Keatings. Attempt missed. Jason Cummings (Hibernian) left footed shot from outside the box is just a bit too high. Attempt missed. Lee Miller (Falkirk) right footed shot from the right side of the six yard box is close, but misses to the left. Attempt saved. Lee Miller (Falkirk) left footed shot from the centre of the box is saved in the top centre of the goal. Corner, Falkirk. Conceded by Liam Fontaine. Attempt blocked. David McCracken (Falkirk) right footed shot from the centre of the box is blocked. Substitution, Falkirk. Lee Miller replaces Craig Sibbald. Attempt missed. Darren McGregor (Hibernian) right footed shot from outside the box is too high. Attempt saved. John McGinn (Hibernian) left footed shot from outside the box is saved in the centre of the goal. Substitution, Falkirk. James Craigen replaces Tom Taiwo. Attempt saved. Jason Cummings (Hibernian) header from the left side of the box is saved in the centre of the goal. Nathan Austin (Falkirk) wins a free kick on the right wing. Substitution, Hibernian. Marvin Bartley replaces Scott Martin. Darren McGregor (Hibernian) is shown the yellow card for a bad foul. Foul by Darren McGregor (Hibernian). Luca Gasparotto (Falkirk) wins a free kick in the attacking half. Attempt blocked. Robert McHugh (Falkirk) right footed shot from the right side of the box is blocked. Substitution, Falkirk. Nathan Austin replaces John Baird. Luke Leahy (Falkirk) is shown the yellow card for a bad foul. Scott Martin (Hibernian) wins a free kick on the left wing.